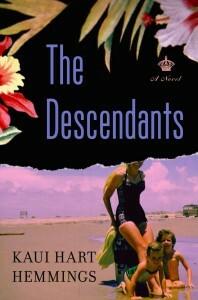 The Descendants is the debut novel of Kaui Hart Hemmings. This book is based in Hawaii, where Ms. Hemmings was born and raised. It tells the story of Matt King, who is the principal heir to a royal Hawaiian family land trust. Matt and his cousins are in the process of deciding what to do with their tremendous holdings. They are on the verge of selling to a local developer but Matt, whose decision it really is, is wavering. In the meantime Matt’s wife, Joanie, has been injured in a boating accident. She is comatose, and her condition is worsening. Her doctors are preparing to honor her living will and withdraw life support. Matt gathers his two troubled daughters and tries to prepare them for saying goodbye to their mother. But Matt has been little involved in their lives, and he is at a loss for how to deal with them. Matt goes on a mission to personally inform everyone close to his wife that she will soon be dying. When he learns from his eldest daughter that Joanie had a lover, he is determined to find him so he can say his goodbye’s. Needless to say, this is a very different concept for a novel. The characters, like the plot, are interesting, three-dimensional people. Hemmings describes the landscape and lifestyle of Hawaii so well that you can really feel you know the places in the novel. I definitely recommend this novel. And I will be seeing the movie version (starring none other than George Clooney) when it opens next month!